Dana Boyd Barr, research professor of environmental health at Emory University’s Rollins School of Public Health, will deliver the 21st Annual S. Dexter Squibb Lecture at UNC Asheville, Oct. 1, 2018. The evening lecture will be livestreamed at 7:30 p.m. in Rhoades Robinson Hall Room 125 and the livestream viewing is free and open to everyone. Barr will speak on “The Importance of the Environment in Human Health,” and discuss the chronology of environmental health and why it is critical to our survival, particularly in times of changing environmental regulations and claims that climate change is not a real phenomenon. 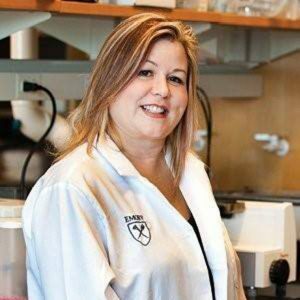 An expert in exposure science – the use of analytical chemistry to assess exposure to a variety of environmental toxins – Barr’s primary focus is on maternal-child health issues. She is the director of the Analytic Core/Targeted Research Resource of the National Institutes of Health-funded Human Exposome Research Center: Understanding Lifetime Exposures (HERCULES) and Children’s Health Exposure Assessment Resource (CHEAR) which provides analytic support for a variety of exposome-related environmental health studies. She also directs “Project 1: Characterizing Exposures in an Urban Environment (CHERUB)” of Emory’s joint School of Nursing and Rollins School of Public Health Center for Children’s Health, Environment, Microbiome and Metabolome (C-CHEM2) which seeks to understand unique exposures of concern in a socioeconomically diverse African American birth cohort in Atlanta and their relation with microbiota, endogenous metabolic perturbations and neurodevelopment. Her other research focuses on understanding prenatal exposures and neurodevelopment in a Southeast Asian birth cohort, the SAWASDEE study, in Thailand. She is an associate editor of Environmental Health Perspectives, editor emeritus of the Journal of Exposure Science and Environmental Epidemiology and past-president of the International Society of Exposure Science. Barr was recently recognized as a Thomas Reuters Top Cited Scientist in Environment/Ecology, 2014 and 2015 (for a 10-year span) and was listed in Thomson Reuters World’s Most Influential Scientific Minds in 2014, 2015, and 2016. The annual Squibb Lectures are named in honor of S. Dexter Squibb, who passed away in 2017. He led the development of UNC Asheville’s Department of Chemistry and chaired the department for three decades, from 1964-1994. He also helped advance the study of chemistry at Western Carolina University and Eckerd College in Florida, and he served as a visiting professor at UNC-Chapel Hill and Clemson University. For information about the Squibb lecture, contact Chemistry Department Assistant Sharon Withrow at 828.251.6443 or swithrow@unca.edu.